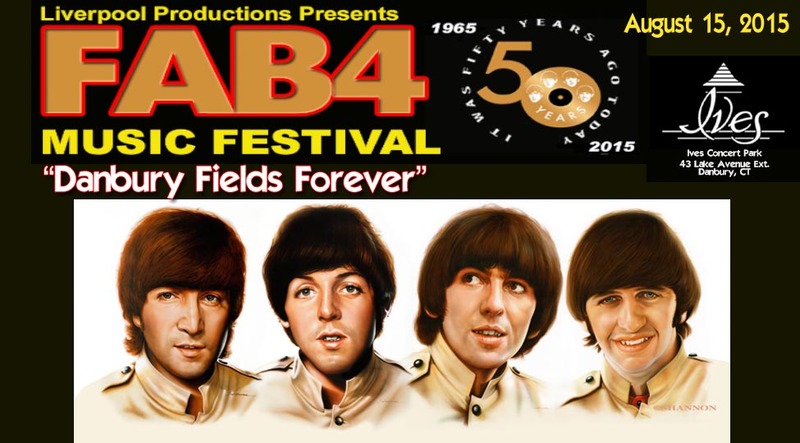 The Fab 4 Music Festival “Danbury Fields Forever” took place at Ives Concert Park in Danbury, CT on Saturday, August 15, 2015. Designed to commemorate the 50th anniversary of the historic first Shea Stadium concert, the festival was held exactly 50 years ago to the date. Produced by Liverpool Productions (“NYC Fab 50” – the Beatles fiftieth anniversary events in New York, the Magical History Tours to Liverpool), the extravaganza also served as a tribute to Sid Bernstein, who produced the Shea Stadium concert(s) and to Grammy Award-Winner Dennis Ferrante, who was John Lennon’s recording engineer and passed away two months prior. Ferrante had come to past concerts in Connecticut, and was a friend of the festival. When fans entered the festival grounds, they were greeted by two banners with the faces of Sid Bernstein and Dennis Ferrante. Doors opened at Noon and the star-students from a New York-based School of Rock began the day with a surprisingly tight set of rockin’ Beatles classics. They were followed by Westchester’s Strictly Beatles, who played the year before under the name BeatleHead. It seemed that there were a few member changes, and the band wasn’t as dynamic as the previous year. Some bands are invited back, and others made their debut. Two solo acts who’d never played this event before completely energized the crowd, delivering their Beatle covers from two separate spectrums. Soul/R&B powerhouse singer Nekita Waller totally owned the stage. Entertaining audiences since her debut at the Apollo as a child, her credits included sharing the stage with BB King, the O’Jays, Ruben Studdard and others. With such great pipes and such a terrific personality, why isn't she already a superstar? Eric Herbst from the band Dizzyfish was the next soloist. The singer/songwriter/guitarist had recently opened for the Steve Miller Band, and his acoustic renditions were a joy to listen to. Eric actually had one of those six degrees of separation connections to The Beatles; in 2008 Eric recorded an album of his original music with Alan White of the band Yes. Alan played drums on John Lennon’s “Instant Karma” and on George Harrison’s “All Things Must Pass” albums. AfterFab played rocking renditions of songs from the Beatles’ solo years, proving that the music of John, Paul, George and Ringo fit in such a setting alongside The Beatles’ group classics. The Massachusetts band were one of the day’s two acts to specialize in solo material, and they were very well-received. Two Connecticut bands, The Navels and NumberNine rocked the crowd as they played songs from the entire Beatles catalog. The Navels are fronted by a great female vocalist, backed by great musicians who not only delivered great versions of Beatles standards but also looked like they were true fan having fun on stage. Their repertoire spanned early standards right up to “Hey Jude.” NumberNine were more like a Fab Faux-esque ensemble, recreating more intricate numbers with precise instrumentation and arrangements. Next up was Long Island’s Penny Lane, who performed songs from the “Sgt. Pepper” album, no easy task for a quartet, and they looked splendid in their colorful Pepper outfits. Their vocals were excellent, and the crowd responded enthusiastically. The Blue Meanies took the stage next and really got the crowd on their feet. After delivering spot-on versions of songs from “Help!” and other 1965 Beatles favorites, the Staten Island/New Jersey band, known for their tributes to The Beatles, The Beach Boys and The Monkees, surprised the crowd when they announced their special guest, Hilton Valentine. Rock & Roll Hall-of-Fame guitarist with The Animals, Hilton Valentine was the festival's Special Guest of Honor, but was not expected to perform. He spent the entire day meeting fans, signing autographs and answering questions about The Beatles, The Animals and the British Invasion. With the Blue Meanies, he played a rousing blues style guitar to some of the Animals’ hits and other well-known blues numbers. The man can certainly rock, and well-deserves his place in the Rock and Roll Hall of Fame. This was the second year in a row that a British Invasion musician was Special Guest at the Fab 4 Music Festival. In 2014, Hermans Hermits bass player and founding member Karl Green made a rare appearance (but did not perform). Connecticut's The Hofners closed the show with an amazing note-for-note recreation of the Beatles’ August 15, 1965 Shea Stadium concert. The band wore the Shea Stadium jackets and ran up to the stage in the same manner as the Beatles did all those years ago. No one was sitting during their performance. This is the same band that has headlined “Danbury Fields Forever” every year, with drummer Mike "Ringo" Streeto, and they continue to impress audiences as one of the foremost Beatles tribute bands on the circuit. In-between acts, host Ken Michaels (of the “Every Little Thing” radio show) and Beatles historian Gary Theroux (rewoundradio.com’s “History of Rock & Roll”) entertained the crowd with stories and trivia. Liverpool Productions' management team, including Kelley, Melissa and Lauren, welcomed attendees as they entered, and a great staff of fans were on hand all day for the festivities. Scattered around the park were lifesize Beatles banners and artwork by the famed Beatles artist Shannon McDonald. Beatles authors Candy Leonard (“Beatleness” ), Jere Hester (“ Raising A Beatles Baby” ), and Vika Winters (“ The Little Girl From Yesterday” ) were there promoting their books along with other vendors selling Beatles merchandise. Food and drink were plentiful, with one vendor getting into the spirit of the festival using Beatles references to name the sandwiches offered. There was an after-party at a local hotel, where fans had a singalong led by Dave Pal from the band "Beatlemania Again," who also guested with The Hofners.